2015/16 has proven to be yet another controversial winter, with very few frosts, heavy rain and winds and no snow at all in the south of the UK. I have very strong memories of growing up in the 1970’s, playing in very deep snow almost every winter. These cold, harsh and white winters seem to be a distant memory. 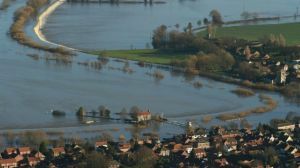 The last few years, the south of the UK in particular, has seen much warmer and wetter winters. 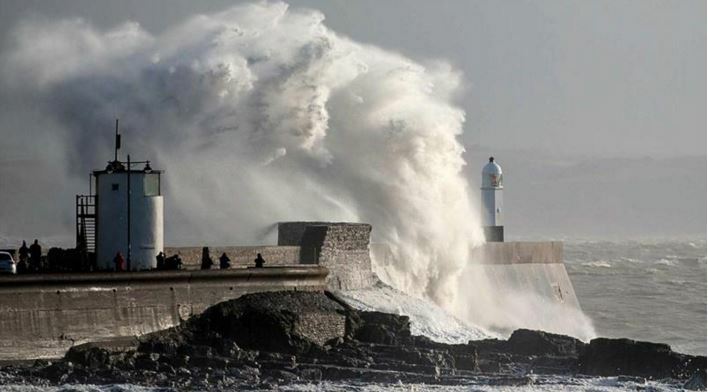 There has been loads of storms and high levels of winds. How has this affected our wildlife this Spring? Met Office figures show December 2015 was the wettest month ever recorded in the UK, with almost double the average rainfall. It was also the warmest December in the UK, with an average temperature of 7.9C, 4.1C higher than the long-term average. So how are we able to accurately gage how this has effected our birds? Well one way is through the RSPB. 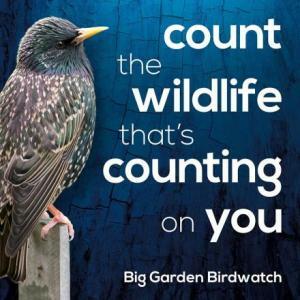 The RSPB has just finished its annual Big Garden Birdwatch where members of the public are asked to record which birds they have noticed in their gardens over the period of one hour. This helps the RSPB build up a better picture of just what the knock on effects of this year’s weather will have meant for the bird populations. This weird weather has also been hotly discussed on TV’s Springwatch as well as various daytime shows. So what really has happened this year with our birds and why may their behaviour, eating habits and migratory patterns be different to normal? So has the UK experienced less numbers of bird visitors due to the birds being able to forage naturally as Ben Andrew suggests or perhaps could the opposite be happening…. If the latter is true, this means that our garden feeders could become a lifeline for certain bird species this year, so make sure to put out plenty of fresh seeds. 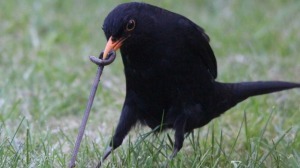 Also birds which rely on digging around in the soil for worms and invertebrates, such as blackbirds, robins and thrush species may also be forced to visit our bird feeders more, if the bugs they seek out have drowned in the boggy and flooded ground. Some of Britain’s most taken-for-granted birds are on a precipitous decline. House sparrows, which have declined 58% since the survey began in 1979, and starlings (down 80%) continue to worry scientists. So despite the warm weather being good for natural foraging, is the lack of habitat and agricultural management effecting the birds? If there is an increase of arable farmland with decrease in natural foods, this would certainly effect the birds ability to forage. Also the lack of hedgerows and heavy management of forests would reduce habitat. 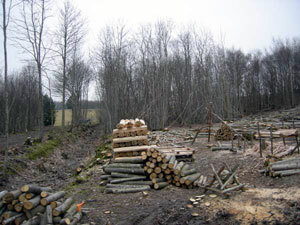 Certainly in my area, in West Kent, I have noticed a heavy deforestation period happening, protected ancient woodlands and natural meadowland are sadly fading into the distant past. One question comes to mind – are we missing any of our usual visitors to our British winter gardens or perhaps this #weirdweather hasn’t had any affect at all? Many of the birds appearing in our British gardens during winter are often migrant birds, who have travelled down from more extreme countries such as Scandinavia and Greenland. 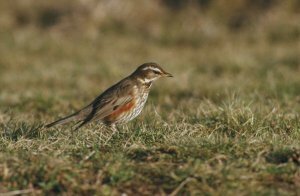 Blackbirds, redwings, fieldfares and waxwings arrive from Finland, Sweden and Norway. 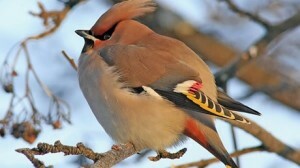 If we see a large amount of waxwings, we can usually presume that the weather is very cold Scandinavia. We haven’t had many waxwings this year, showing that the weather in northern Scandinavia may have been mild or they are simply camping out in other southern European countries instead. Birds migrate south, not just because of frozen food sources, but lack of daylight hours to forage, so many of the Scandinavian migrants will still fly south despite the milder weather in their own native countries. However, with the stormy windy weather, it can be deadly to cross the North Sea to the UK and often these species will set up camp in European countries such as Belgium and Holland instead. 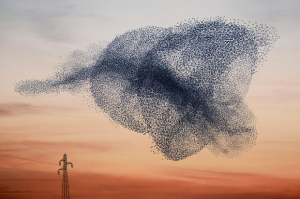 If this is the case with starlings, then the UK will have noticed this year less murmurations in Somerset – a clear sign that the starlings have decided to stay put on mainland Europe and not risk the danger. This mild weather, despite the wind and storms, has however, encouraged certain less common birds to visit the UK. Sightings of swallows and swifts were observed in December which is highly usual and The Common Swift was seen for the first time ever. Also the mild winter has definitely resulted in some early flowering of berry producing bushes and trees. I know that I have seen a few in bloom in my local area. This will most certainly have a knock on effect later on in the year, as the flowers will have opened before bees have emerged from winter hibernation. The flowers will be sterile and later on in the year, far less for berry eating birds. 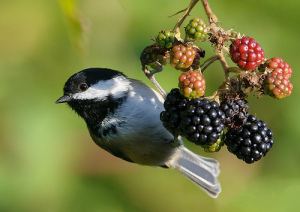 Perhaps one thing we can do to help is maybe later on in the year, we could look to include food sources for berry eating birds on our bird tables, if we find that berry trees and bushes are producing far less. Only time will tell this year if this has been the case. Another question which has been hotly discussed is to whether certain bird species will start breeding earlier than usual due to the mild weather. Some members of the public did tweet out photos of supposed fledgling sightings after Springwatch’s Chris Packham asked if the #weirdweather had resulted in usual bird behaviour. So would this mild weather definitely affect early breeding? If its pigeons, they will breed all year round if there is a constant food source, so this would not be unusual to see. Robins start courting around Christmas, so this would not be unusual either. Blackbirds may manage to raise four lots of fledglings if they start breeding earlier than usual due to the mild early spring, but last year saw a high level of blackbird fledgling predation by birds such as magpies and jays and numbers dropped, so even though they may start to breed earlier than perhaps normal, the predation by other birds could counter this out, especially if food sources are low for the predatory birds. There were reports of sea birds, such as puffins, guillemots and razorbills suffering terribly with the stormy weather back in 2014 when significant losses were reported. This was due to exhausted birds being washed ashore after repeated unsuccessfully attempts of trying to catch fish in choppy and stormy seas. This year has had a fair amount of storms, but hasn’t been reported as being as bad as 2014, but sea bird losses could still be significant. 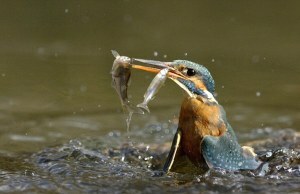 Also the flooding and turbulent rain will have increased swells in local river systems which may be affecting dippers and kingfishers who rely on slower flowing, clear water to find their prey. In 2014, the stormy weather with high levels of rain, was responsible for a huge drop in the amount of wasps due to hibernating queens being flooded out over winter. This resulted in a high amount of caterpillars and bugs. If the same happens this year, then bug foraging birds will have a higher amount of food, as cabbage moth caterpillars and other bugs thrive in greater numbers than usual. However if the mild winter brings bees out of hibernation early with no flowers to pollinate, you may see far less berries later on. The wet weather does tend to stop the bees peeking their heads out of their warm winter hide outs, so finger crossed that our bees are safe this year.. One thing is for sure, the worms will have taken a huge hit due to being drowned in the boggy ground and this could take a while for the numbers to recover. 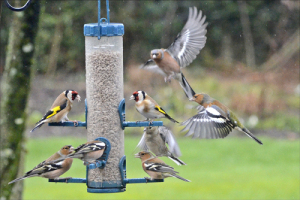 The results for the 2016 Big Garden Bird Watch are not out yet, so we will have to sit tight, but one thing is for sure, whether this is global warming or the earth simply going through a strange cycle phase, it is not good for our wildlife to have to content with such differences to their usual patterns. 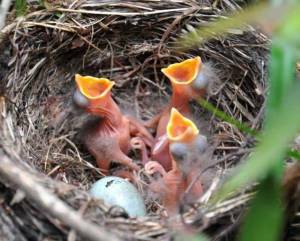 Certain types of birds will suffer this year and others will thrive. If our warm, wet and stormy weather carries on, our winter migrants may include much more sightings of unusual birds than in the past and many of our normal visitors may decide to stay put in Europe. 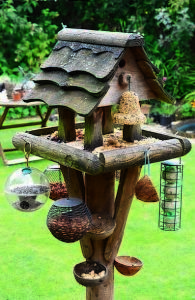 Make sure to keep your bird tables stocked up with fresh and non-mouldy food, which includes meal worms as well as nuts and seeds, so all birds can enjoy and benefit from the help we can give them.